Hungry Bear Publishing is a home-based business, operated mainly to publish owner Andy Flynn's books, and does not accept submissions for publishing at this time. Below, you will find books from other authors that Andy helped self-publish, plus a reprint of "Mostly Spruce and Hemlock." LIBRARIES: Library directors should order books directly from Andy Flynn, author and publisher, at Hungry Bear Publishing, (518) 891-5559, adkhungrybear@yahoo.com. WHOLESALE: Retail operations looking to sell these books should order directly from Andy Flynn, author and publisher, at Hungry Bear Publishing, (518) 891-5559, adkhungrybear@yahoo.com. KINDLE E-BOOKS On Feb. 17, 2013, Hungry Bear Publishing launched its latest eBook, "New York's Adirondack Park: A User's Guide," on Amazon.com's Kindle platform. All six "Adirondack Attic" books are now available as e-books on Kindle, the e-book platform for Amazon.com. They are titled: "Tales from the Adirondack Attic." WARNING: They are text-only versions and do not include any photographs or extra stories. To see the photos and read the extra stories, please purchase the print versions listed below. See Andy Flynn's book section at Amazon.com. Two years after a near-death experience due to his weight, Lake Placid News Editor Andy Flynn began the Lake Placid Diet weight-loss journey, sharing his progress and struggles with readers every week. He was 470 pounds. Within a year, Flynn made enough changes to build a foundation for a healthier lifestyle, using a community approach to weight loss, and it saved his life. He found many resources to help him, including a fitness center, support groups and natural food stores. 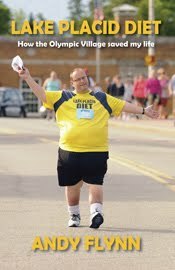 In the process he began walking in local races, completing the Lake Placid Half-Marathon twice. This book covers the first 18 months of the Lake Placid Diet. With 80 pounds lost, and 170 more to reach his goal weight of 220 pounds, this is just the beginning. The journey continues. ORDER: Call Andy Flynn at (518) 891-5559 (all credit cards accepted). 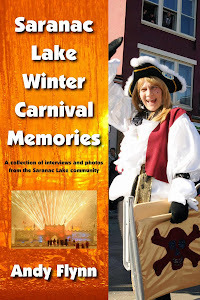 This 440-page book answers the question, “What is the Saranac Lake Winter Carnival?” Andy Flynn uses the 2012 and 2013 Winter Carnivals as examples of how this 10-day festival is operated. Get a behind-the scenes view from Carnival Committee members. Meet residents, visitors and royalty who have memories to share. The 10 chapters are: The Theme; Carnival Committee; Ice Palace; Royalty; Gala Parade; Other Events; Community Life; Some History; Mementos; and The Future. “Memories” includes 75 interviews, more than 350 photos, essays by Andy Flynn, a timeline of Winter Carnival events since 1897, and submissions by local historians. Adirondack History, New York History, U.S. History, U.S. Travel. This 96-page book answers the question, “What is the Adirondack Park?” With information from the Adirondack Park's leading government, not-for-profit and historical organizations, the "User's Guide" gives the public - residents and visitors - a valuable reference guide that helps them responsibly use the Forest Preserve while giving them informational links to community assets, such as attractions, special events, communications, transportation, tourism organizations, and recreational opportunities. There are also helpful tips on using the Forest Preserve, hiking, camping, fishing, horseback riding, bicycling and more. Officials from the New York State Adirondack Park Agency and Department of Environmental Conservation contributed to this book, along with members of the Adirondack Forest Preserve Education Partnership: the DEC, Adirondack Regional Tourism Council, Adirondack Mountain Club, Wildlife Conservation Society, Adirondack Park Invasive Plant Program, and Leading Edge. The book includes 13 of Andy Flynn's stories from the "Adirondack Attic," straight from the archives of the Adirondack Museum. Adirondack History, New York History, U.S. History, U.S. Travel. This book includes the 53 "Adirondack Attic" columns written in 2008 plus a chapter on Andy Flynn's Adirondack Attic Time Machine chair made for the Lake Placid Center for the Arts auction. The 240-page book includes more than 70 photographs. Stories about the artifacts at the Adirondack Museum in Blue Mountain Lake, NY. Adirondack History, New York History, U.S. History. This book was released in 2008 and includes the 52 "Adirondack Attic" columns written in 2007. The 240-page book includes more than 70 photographs, winning essays from the 2007 Adirondack Attic Local History Contest, and a five-year look back at the Adirondack Attic History Project. This book was released in 2007 and includes the 52 "Adirondack Attic" columns written in 2006. The 240-page book includes more than 70 photographs, one Self-guided Adirondack History Driving Tour (Fulton Chain of Lakes), and features on the Adirondack Gilded Age Heritage Tour (Adirondack Museum, Great Camp Sagamore, Raquette Lake Navigation Company) and the Goodsell Memorial Museum in Old Forge. This book was released in 2006 and includes the 52 "Adirondack Attic" columns written in 2005. The 240-page book includes more than 70 photographs, three Self-guided Adirondack History Driving Tours, and features on the Six Nations Indian Museum in Onchiota and the Saranac Laboratory in Saranac Lake. This book was released in 2005 and includes the 52 "Adirondack Attic" columns written in 2004. The 240-page book includes more than 70 photographs, an artifact-inspired short story, and features on Fort Ticonderoga, the Lake George Historical Association Museum and The History Museum in Lake Placid. Enjoy stories from around the Adirondack North Country region. This book was released in 2004 and includes the 45 "Adirondack Attic" columns written in 2003. The 184-page book includes more than 50 photographs and an artifact-inspired short story. Enjoy stories from around the Adirondack North Country region in this first issue of the Adirondack Attic book series. Diane Chase is the author the Adirondack family activity guidebook Adirondack Family Time Tri-Lakes and High Peaks: Your Four-Season Guide to Over 300 Activities (with GPS coordinates). Covering the towns of Plattsburgh, Westport, Elizabethtown, Keeseville, Au Sable Forks, Essex, Willsboro, Port Henry, Crown Point and Ticonderoga, this comprehensive guide lists over 58 mini-hikes, 33 swimming holes, 30 historic sites, seasonal events and activities, performing arts centers, trivia and more. Diane Chase is the author the Adirondack family activity guidebook Adirondack Family Time Tri-Lakes and High Peaks: Your Four-Season Guide to Over 300 Activities (with GPS coordinates). Covering the towns of Lake Placid, Saranac Lake, Tupper Lake, Jay/Upper Jay, Keene/Keene Valley and Wilmington, this comprehensive guide lists over 33 mini-hikes, 19 swimming holes, 26 historic sites, seasonal events and activities, performing arts centers, trivia and more. This is a collection of essays and poems about life around her home in Paul Smiths, N.Y. She celebrates life as a mother, daughter and wife and her connection to the natural wonders of the Adirondack Mountains in New York state. In Chapter 1, "Adirondack Living: Engaging With Place," Randy Lewis explores life as a true Adirondack woman in essays such as "Mother's Day," "Rhythms," "Rainwalk," "Celestial Season," "Community Spirit" and "Waterfalls." Chapter 2, "Life Around Here: Saranac Lake and Environs," includes the essays "Once, in a Blue Moon," "Filling in the Empty Spaces," "Spring Cleaning," "After Earthquake," "Adirondack Archeology" and "Running." Chapter 3, "Mountain Culture: What We All Understand," features the essays "These Mountain Roads," "Biting Flies," "Father's Day," "Summer Camp," "Indian Summer," "Rituals of Winter" and "Tax Time and Picnics." In Chapter 4, we see "Three Views of Black Bears." Chapter 5 is filled with "A Handful of Adirondack Poems." Learn how to order by calling Hungry Bear Publishing at (518) 891-5559. This reprint of the 1976 classic history of the village of Tupper Lake and town of Altamont, Franklin County, in New York State's 6-million-acre Adirondack Park includes a new index by author Carol Payment Poole and a foreword by Tupper Lake Free Press Publisher Dan McClelland. It was written by the late Louis J. Simmons, Free Press editor for more than 40 years and former Tupper Lake historian. It includes many pictures from the Tupper Lake community from the 1890s to the 1970s. Themes include: logging, railroads, early hotels, pioneer families, schools, churches and health care facilities.